Forget DLC or expansions - Legend of Grimrock is getting a full-on sequel. Have I mentioned lately how much I liked Legend of Grimrock? Because I really did. So while last night's PlayStation 4 reveal was interesting, today's announcement of Legend of Grimrock 2 - or whatever it ends up being called - has me really wound up. Almost Human co-founder Petri Hakkinen said in a new blog post that the team has been referring to its current project internally as Grimrock DLC, but nobody seemed to have a whole lot of enthusiasm for the idea. "So, today we had a massive all day meeting where we discussed the project, drew some arcane patterns on the whiteboard, analyzed the project from many different angles and most importantly listened to our hearts for the answer to the big question: What [do] we really want to accomplish with the new project?" he wrote. It turns out that what they really want to do is a whole new game. 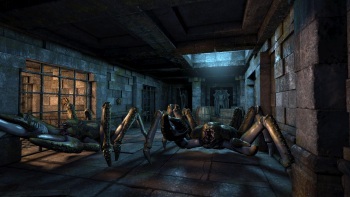 "Creating a mere DLC or expansion to Grimrock simply would not have felt right. As today's meeting proved, we still have a lot of ideas we'd like to explore, lots and lots of new content already done (originally made for a DLC/expansion) and a big engine update in the works. Simply put, a DLC would have limited too much what we can do. With a full blown sequel we can raise Grimrock to the next level," he continued. "I'm sure you had all this figured out for a while already, but announcing a project is something we don't take lightly, so we had to be really sure that this is the thing we want to blow our hearts and souls into." Platforms, release dates and all that good stuff are still just a distant dream, but Almost Human did toss out a couple of screens in January that, while undeniable Grimrock-y, show off some interesting new settings, one a run-down mine and the other some kind of ancient Egyptian-style motif, complete with shambling zombie. They may not actually have anything to do with the next game, but it's nice to know that Almost Human isn't sick of old-time dungeon crawling just yet.